Two years ago, three University of Texas at Austin professors — Jennifer Lynn Glass, Lisa Moore and Mia Carter — filed a lawsuit against state Attorney General Ken Paxton and several leaders of the UT System over a 2015 law that allows concealed handguns on college campuses. The professors argued the law infringed their First Amendment right to academic freedom, saying a "chilling effect" pervades their classes when students can bring guns into the room. The law went into effect in August 2016 and was immediately met with stiff backlash on campuses, particularly at UT-Austin. The lawsuit, filed in federal court, sought to block the law and allow the professors to prohibit firearms in their classrooms. A federal judge turned down the request and dismissed the case last year, saying the professors failed to provide evidence that guns infringe on the professors' free speech or that they have the authority to nullify state law in their classrooms. Marc Rylander, director of communications at Paxton's office, called the lawsuit "frivolous" with "no legal standing" in a written statement. "Last year, a U.S. District Court determined that a handful of professors could not deny a licensed, law-abiding citizen on campus the same measure of personal protection that they are entitled to throughout the rest of the state," the statement said. "The right to keep and bear arms is guaranteed for all Americans, including college students, and that right cannot be stripped away by a small group of professors who dislike the law." The suit then went to the 5th U.S. Circuit Court of Appeals in New Orleans, which will hear arguments at Wednesday's session. The law allows licensed handgun owners to bring their weapons onto public university campuses and prohibits universities from making policies that would effectively ban handguns. It charges university presidents to create policies for carrying guns on campus and allows for universities to create certain gun-free zones. Private universities are allowed to opt out of campus carry, and after the law went into effect, all but one did. 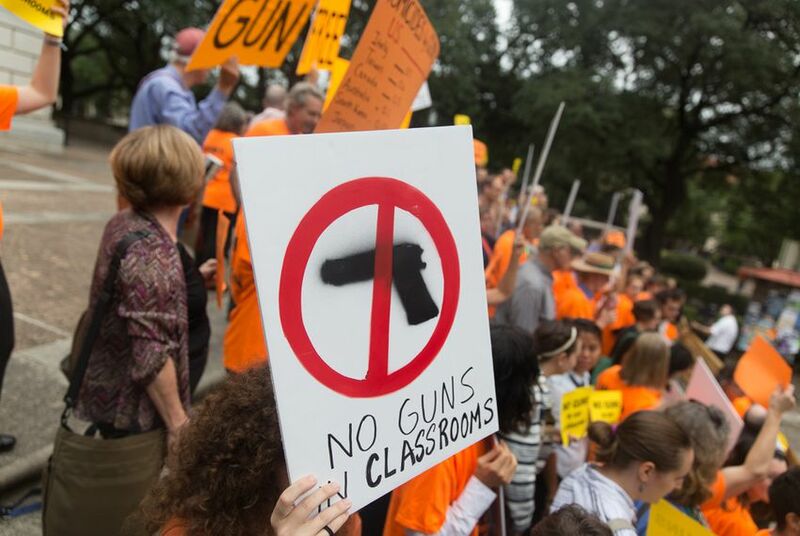 UT faculty and staff are prohibited from banning handguns in their classrooms. UT-Austin policy bans handguns from high-risk parts of campus such as laboratories with dangerous chemicals or areas dedicated to health care. Texas is one of 10 states that allow campus carry, according to the National Conference of State Legislatures. Moore, who teaches English literature, said she's optimistic about Wednesday's appeal. Recent news of gun violence in the country, such as the shooting at Santa Fe High School south of Houston in May, shows the need for more sensible gun reform, she said. She and the other two professors, who all teach in the College of Liberal Arts at UT-Austin, want their students "to see us standing up for them," Moore said. "I hope we don't have to have more deaths and school shootings to convince people that guns don't belong in the classroom," Moore said. In February, two national activist groups — Students for Concealed Carry and the Students for Concealed Carry Foundation — filed a joint amicus brief in support of the policy, arguing that granting professors a degree of autonomy that bars licensed gun-carriers from entering their classrooms in the name of academic freedom could set a precedent for professors to use academic freedom to rebel against any university policy they dislike. Quinn Cox, southwest regional director for Students for Concealed Carry and a student at UT-Austin, argued that several states have had concealed carry on campuses for years, and none of the deadly shootings on campuses have been perpetrated by someone licensed to carry. Max Renea Hicks, the professors' lawyer, said the request to have guns removed from classrooms is something "virtually any normal person" would advocate, especially following the many mass shootings at schools across the country in recent years. Texas has allowed guns in public school classrooms for years under its controversial school marshal and school guardian programs. But those only allowed faculty or administrators to carry guns in schools, and usually the guns are kept in secured lockers. Current state laws allow for students to have guns in their backpacks. Hicks said that kind of environment can intimidate students and faculty, limiting the scope of discussion int he classroom. Hicks argued the Second Amendment allows for guns in the home, but does not guarantee to right to carry them to class. Even late conservative Supreme Court Justice Antonin Scalia argued that guns should stay out of the classroom, Hicks said. "We have a Second Amendment right to have a gun in the home. It doesn't go beyond that," Hicks said. "All those things only show that these professors' concerns are reasonable." Correction: A previous version of this story included an incorrect spelling for Max Renea Hicks.